Having a choice in what we eat is something many of us take for granted, but four million Canadians aren't sure where their next meal will come from. Food insecurity is a real and imminent threat to the health of us all — but there's a lot we can do to improve things. If you can afford it, the choices inside grocery stores are seemingly endless. Fruits and vegetables shipped from all over the world and hearty prepared meals that take the hassle out of cooking are just a taste of what can be found at any big box grocery store today. For those who cannot afford it, however, choice is out of reach - both financially and geographically. As grocery stores with healthy food options are closing down in neighbourhoods all over Canada, the citizens who need them the most are the ones left behind. "Over the past year our food deserts have increased in size, number and severity." Fortunately, there are ways we can mobilize and use our power to address food insecurity within our community. 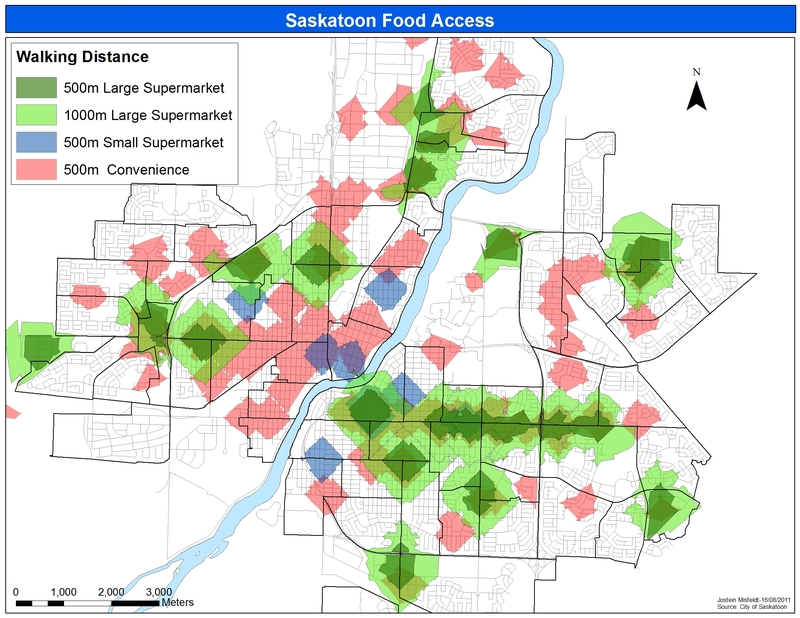 Our home community of Saskatoon has a well-documented history of social and health inequities, and access to healthy food is no exception. Core neighbourhood residents face a distinct lack of nutritious food options, as the majority of nearby food stores are fast-food and convenience marts full of high-energy, low-nutrient foods. A healthy diet can reduce the risk of developing chronic conditions like diabetes, heart disease and cancer. Living in these ‘food deserts’ — areas with low geographic access to nutritious foods — can be extremely harmful in the long run, particularly among people without vehicle access or strong public transit networks. Over the past year our food deserts have increased in size, number and severity. On September 10th 2015, residents in the City Park neighbourhood were informed that Loblaws was closing their 7th Avenue Shop Easy chain, and with it, their only grocery store. Early 2016 brought news that the non-profit Good Food Junction grocery store was closing its doors in another central neighbourhood, Riversdale. Being a student of population health and having started my research career on this very topic, I joined a small group of fellow concerned citizens. We knew we needed a solution outside the monopoly of corporate grocery forces, one that required cooperation and a commitment to equity. We believe that without having equal access to healthy food for Saskatonians living in the city centre, we risk the well being of Saskatoon as a whole. As one City Park resident said during the community association meeting following the closure of Shop Easy, "This is a question for the entire city. What kind of city do we want?" Months of hard work and potluck-meetings later, we formed the City Centre Food Cooperative (CCFC). The CCFC was founded on the belief that everyone deserves access to nutritious food, regardless of social and economic factors. The ultimate vision of the organization is to aid in the development of a sustainable healthy food store in central Saskatoon, while fostering community-led development. A cooperative is a type of business that is run for the benefit of those who utilize it. Unlike a corporate structure, a co-op does not seek profit for its owners, and so co-op prices can be kept low and affordable. There are member shareholders who work together to cover the costs and collaboratively make decisions about the business. Under international standards, a cooperative must be based on values of self-help, self-responsibility, democracy, equality, equity, and solidarity. The CCFC is designed to do just that. Working closely with the community in both formal and informal ways, we work to ensure that we are meeting the needs of people living in Saskatoon's central neighbourhoods..
We are not Saskatoon’s first food co-op. Steep Hill Food Co-op on Broadway has been a source of mentorship to help us assess the feasibility of our vision, mission and mandate. Their advice and continued support inspires us to pursue our vision. "Everyone deserves access to nutritious food, regardless of social and economic factors." Our first task was to lobby against a land sale caveat that prohibited any new retail development on the site that sold food, alcohol, flowers or pharmacy items. Thanks to the hard work of the City Park councillor Darren Hill with the support of the Community Association, Loblaws agreed to lift the caveat. We are thrilled for the prospect of a community-minded grocery store to take up residence there in the future. Working with community groups like CHEP Good Food Saskatoon, City Park Community Association, Affinity Credit Union, and the Saskatoon Community Service Village, we have established a bi-weekly downtown pop-up market to sell affordable fruits and vegetables, where we are reaching residents that may not be able to make regular trips to the big-box grocery stores. Our short-term goal is to expand the operation so that we can offer evening hours to provide more nutritious food to more people. With the gracious support of many local organizations and the enthusiasm of our co-op members, we are confident that together it is possible to create equitable food access in our community. The City Centre Food Coop, chock-full of Upstreamists. We are always looking for volunteers! Please send us a note at citycentrecoop@gmail.com. Check here for upcoming markets and take a look at our fact sheet for more information. To celebrate the first anniversary of the CCFC we're hosting a fundraiser - Lettuce Turnip the Beet! - on Saturday, September 17th at the Grazing Goat (9 pm onwards). There will be beet-themed drink specials and draws for prizes throughout the night. All proceeds of the fundraiser will go towards expanding the Pop-Up Produce Market, a CHEP-supported initiative offered by the CCFC to provide affordable fresh fruits and vegetables to city-centre residents. Tickets are $10 in advance and $15 at the door. To purchase tickets please email us at citycentrefoodcoop@gmail.com or reach us through a direct message on Facebook or Twitter. This last year has inspired us to no end! We at the CCFC are eager to continue the momentum and to meet with others passionate about improving Saskatoon's food environment. Photos provided by the Good Food Junction and City Centre Food Co-op.